In hemodynamically stable patients, the history and physical are insufficiently accurate to either rule in or rule out ectopic pregnancy. 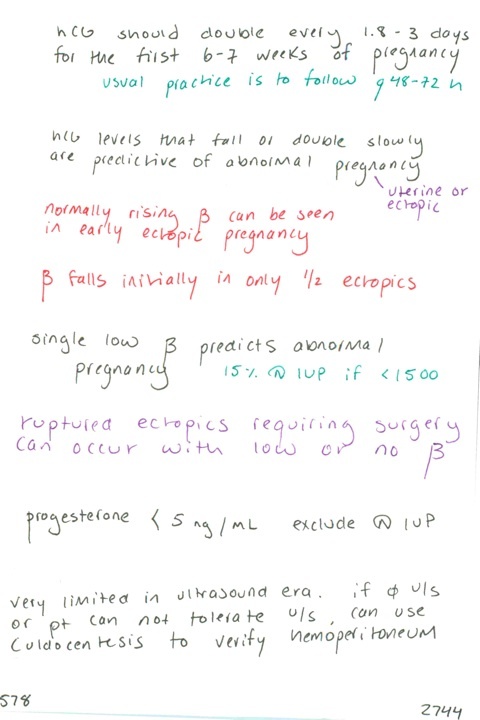 The threshold should be very low to enter a patient with early pregnancy and symptoms or signs potentially referable to ectopic pregnancy into a rule out ectopic process. In contrast to what most of us were taught, the index beta HCG measurement does not discriminate among ectopic pregnancy, failed/failing intrauterine pregnancy, and early/healthy intrauterine pregnancy with sufficient accuracy to guide decision-making. Put more simply, the beta does not help you. If the ultrasound shows no IUP or ectopic, do not be reassured by a low beta and do not be alarmed by a high beta. The patient may have a healthy IUP, she may have a nonviable IUP that is miscarrying or will miscarry, or she may have an ectopic pregnancy; the beta doesn’t make any of these three diagnoses more or less likely enough to be a useful test to us, on the index visit. This is not controversial, the evidence is plentiful [1, 2, 3, 4, 5, 6, 7], and ACEP’s recent clinical policy states at a Level B recommendation, “Do not use the beta-hCG value to exclude the diagnosis of ectopic pregnancy in patients who have an indeterminate ultrasound.” If the beta is a million zillion, feel free to diagnose molar pregnancy. If IUP is confirmed by ultrasound, measurement of quantitative beta is unnecessary. If ultrasound shows no evidence of IUP or ectopic, a quantitative HCG level should be sent but the result is not important for this visit–it is useful in comparison to the beta drawn in followup. A low beta should never be used as a reason to forgo pelvic ultrasound, and a high beta should never be used as a reason to initiate treatment for ectopic pregnancy (in a stable patient). The concept of the discriminatory zone is obsolete and has no value to emergency clinicians [1, 2, 3]. There are a variety of abnormal early pregnancy conditions, and the terminology is confusing. Threatened abortion refers to a patient with a confirmed IUP who has bleeding or pain; these patients are not at risk for ectopic pregnancy and threatened abortion should not be used as a diagnosis for patients with pregnancy of undetermined location. Similarly, patients with missed, inevitable, incomplete, and complete abortion by definition to do not have ectopic pregnancy, and, like threatened abortion, these conditions are generally not dangerous to mom. Often, these diagnoses can only be made after repeat ultrasound and beta measurements. I liken these diagnoses to migraine, tension, cluster, and other primary headaches: the role of the emergency clinician is not to diagnose a benign headache syndrome, it is to exclude dangerous causes of headaches. Confident as you may be that your patient without a sonographic IUP is having some variant of miscarriage and not an ectopic, to make that diagnosis prior to the beta falling to zero (or the passing of what is unequivocally products of conception, i.e. has a human form or characteristic features under a microscope) is unwise. Septic abortion, while not an ectopic pregnancy, is dangerous, and patients with early pregnancy and fever, unwell appearance, or significant uterine tenderness should be managed with this condition–which generally requires prompt surgical uterine evacuation in addition to parenteral antibiotics–in mind. Most patients who present to the ED with bleeding or pain in early pregnancy are primarily concerned about the viability of their pregnancy, while the emergency clinician’s priority is excluding the presence of a dangerous condition–in this case, mainly ectopic pregnancy. It is important to recognize and address this discordance. Attempting to determine if the pregnancy is likely to succeed or fail on the index visit is imprudent in most cases, but not acknowledging your patient’s concerns is equally imprudent. 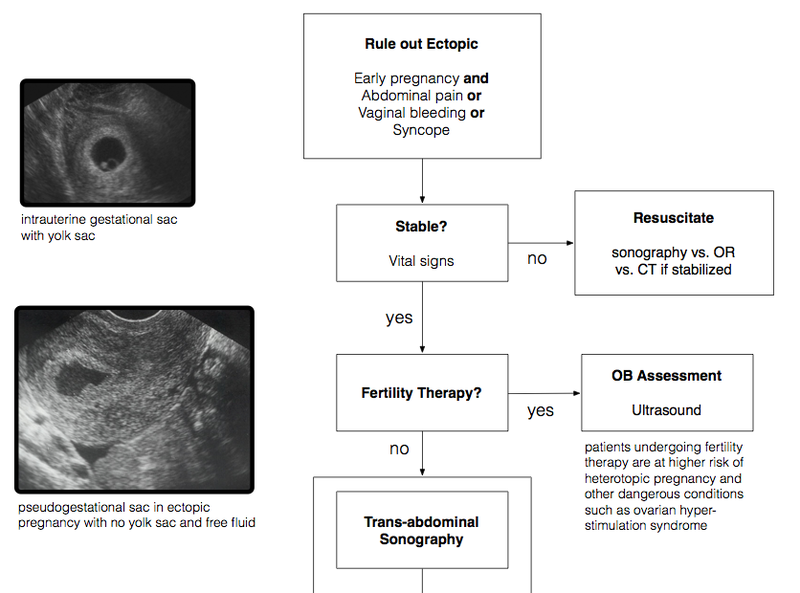 Much practice variability exists around who performs the ultrasound–the emergency clinician, obstetrician, or radiologist–in different rule out ectopic scenarios. Emergency physician-performed ultrasound has been demonstrated to be accurate in this context, and it is reasonable and appropriate for emergency physician-performed ultrasound to be used as the primary imaging modality in a rule out ectopic paradigm, especially when the emergency physician has demonstrated proficiency in pelvic ultrasound and the study is performed under a structured departmental ultrasound QA process. 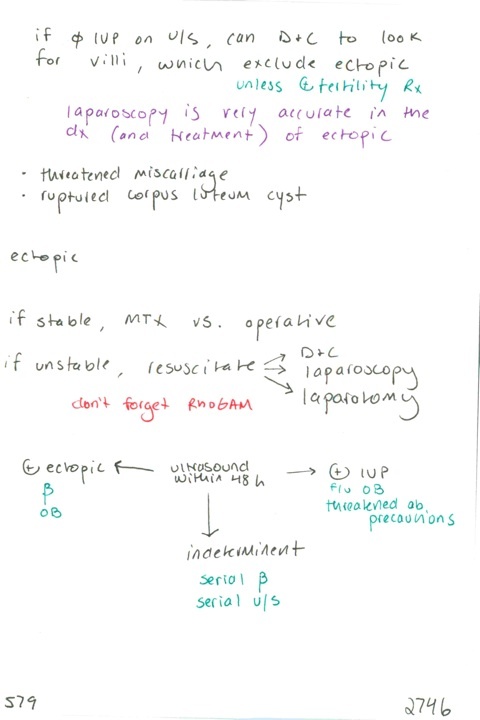 But sometimes an ectopic pregnancy can look like an IUP, and calling what isn’t an IUP an IUP is a very dangerous mistake (don’t neglect to evaluate the myometrial mantle all around what you think is an IUP). 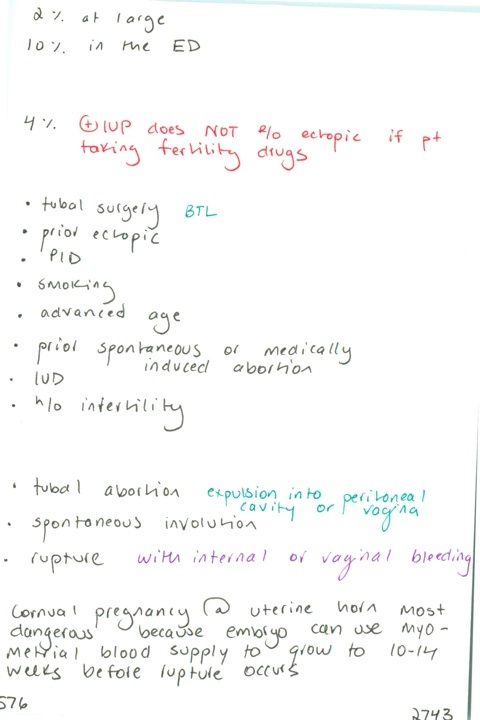 Also, we generally rule out ectopic by ruling in IUP, and when an IUP is definitively identified in a patient not at high risk for ectopic or heterotopic pregnancy, ectopic pregnancy has been reasonably excluded. However, in a patient without sonographic IUP, the second goal of imaging is to look for evidence of ectopic pregnancy, and these findings, often in the adnexa, require more ultrasound skill. a. Discharge the patient after emergency physician-performed ultrasound either with a diagnosis of intrauterine pregnancy and routine followup, or with a diagnosis of pregnancy of undetermined location, strict ectopic precautions and urgent followup, based on the results of the emergency physician-performed ultrasound. b. Discharge patients who do not have ectopic risk factors and have PUL after emergency physician-performed ultrasound with ectopic precautions and urgent followup; arrange immediate specialist-performed ultrasound for patients with ectopic risk factors who do not have an IUP identified by the emergency clinician. This is the strategy I use. c. Arrange immediate specialist-performed ultrasound for all patients who do not have IUP identified by the emergency clinician. d. Arrange immediate specialist-performed ultrasound for all patients who enter into the rule out ectopic flow. 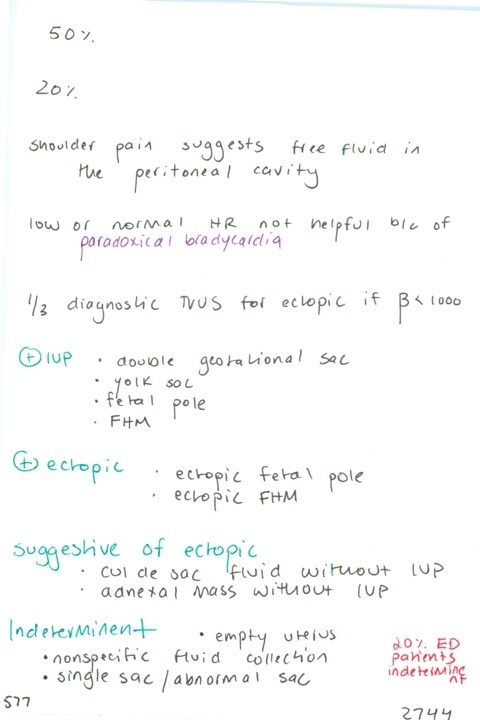 There are other approaches and gradations within these approaches; for example, if you usually discharge a rule out ectopic patient after your bedside ultrasound but have a patient you are more concerned about than usual, but don’t have access to specialist ultrasound or assessment, have the patient return for repeat assessment not in 48 hours but in 24 or 12 hours. The use of Rhogam for threatened abortion or pregnancy of undetermined location is even less likely to be beneficial than in cases of diagnosed miscarriage, which was the subject of the quoted Cochrane review. 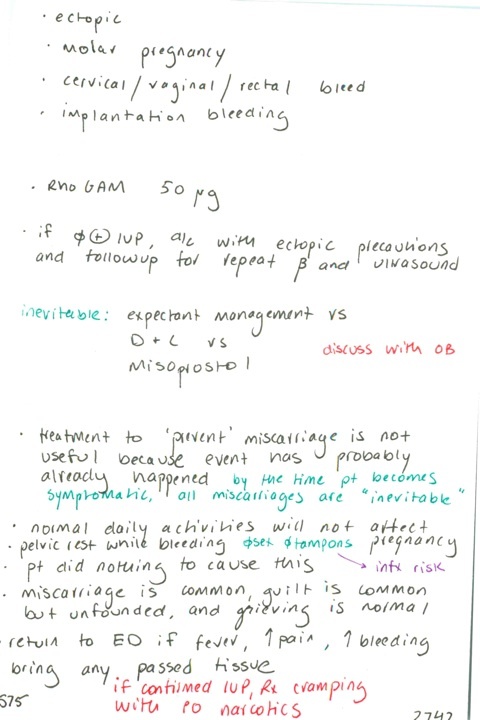 ACOG recommends it “after a first-trimester pregnancy loss” and suggests it “be considered” in cases of threatened abortion, while British guidelines state, “Do not offer anti-D rhesus prophylaxis to women who receive solely medical management for an ectopic pregnancy or miscarriage, or have a threatened miscarriage, or have a complete miscarriage, or have a pregnancy of unknown location.” ACEP chimes in with their Level B recommendation “Administer 50 μg of anti-D immunoglobulin to Rh-negative women in all cases of documented first trimester loss of established pregnancy” and Level C “Consider administration of anti-D immunoglobulin in cases of minor trauma in Rh-negative patients.” See SMART-EM‘s treatment of the subject for details. If you don’t use Rhogam routinely in threatened abortion, most of these patients can return home to their loved ones immediately if IUP is identified, without bloodwork, and even, some say, without a pelvic exam [1, 2]. Ideally all patients with pregnancy of undetermined location would be seen by an obstetrician within 48 hours for repeat exam, ultrasound, and serum beta. If the only option in your environment is for the patient to return to the ED, if IUP is not identified on the repeat visit, have a low threshold to at least discuss the case with an obstetrician. Interpreting beta trends and deciding on therapies like methotrexate, or uterotonic agents, or dilation and curettage, is ideally in the domain of obstetrics and not emergency medicine. Thanks to Sigrid Hahn and Phil Andrus for their erudition. 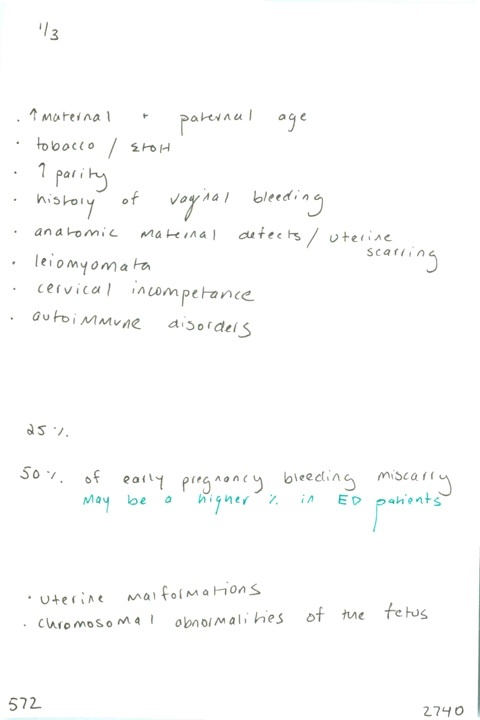 Bonus: amazing/bewildering vaginal bleeding algorithm I created as a medical student many years ago, demonstrating outdated strategies for rule out ectopic, among many other outdated strategies. 580. 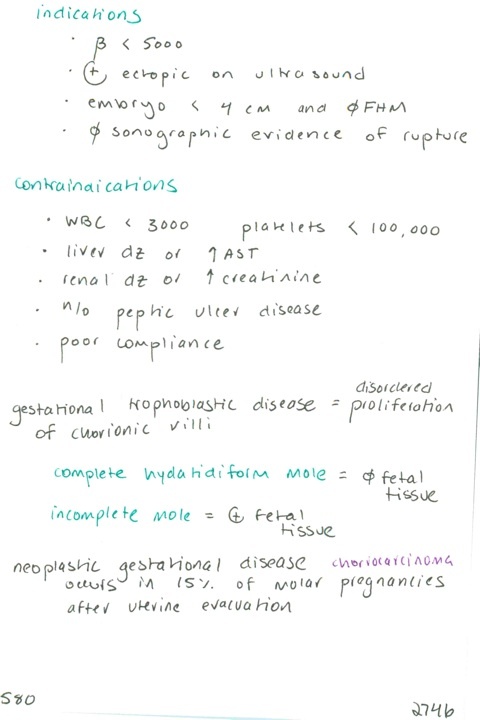 Indications for methotrexate in ectopic, contraindications / What is a molar pregnancy? What are the two types? Long term consequences?